Fortune Tellers were wildly divergent in form, but operated on two very ancient mechanisms of chance: spinning pointers (or disks) and shuffled cards. The spinner is the prototype gaming machine. It's a small step from passively reading a fortune or disposition from a dial to staking the future on it by placing bets. Such simple mechanisms, which offered nothing to the punter but the indulgence of superstition, made them an excellent proposition in the early days of coin-operated automation. The rows of electric lamps on later machines were essentially the same, with a revolving battery contact replacing the pointer. Card dispensing fortune tellers were simply vending machines disguised to sustain suspension of disbelief. An impressive outward appearance obscured a primitive inner mechanism, often incorporating animated figures and other automata. Dumb blondes and fiery red heads? So your disposition is betrayed by your hair colour! 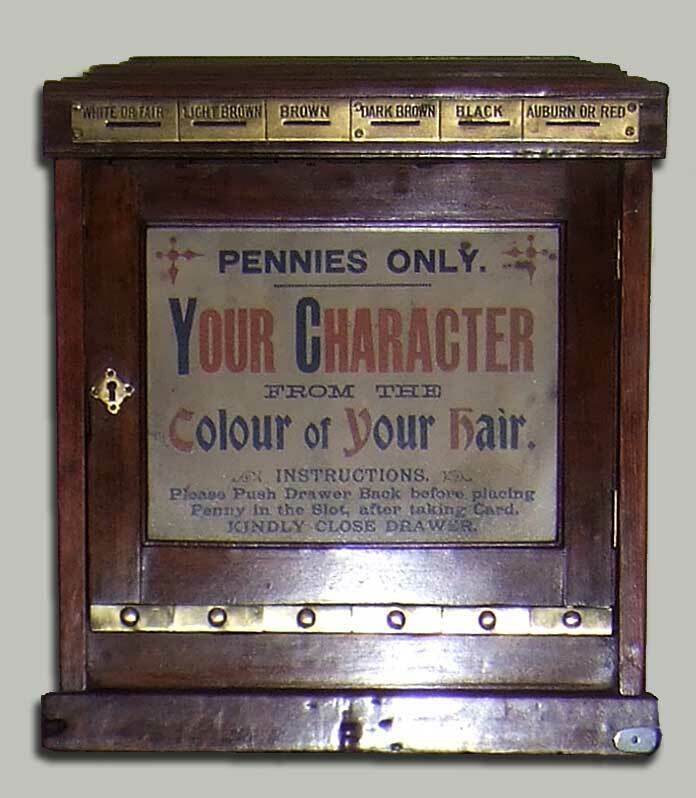 This early, rather plain wall machine exploits the notion, offering personality readings for a penny, a not inconsiderable sum at the turn of the century.